Fishers Appliance Repair is a same-day appliance repair service located in Hamilton County Indiana. We are pleased to serve the residents of this city as a family owned and operated service for repairing all major appliance brands. We focus ourselves daily on high-quality client care and attention to the elements of our trade. We always do the things that we can to let folks know much we appreciate their trust and their business! When you get a service call from one of our experienced local technicians you are continually in great hands. We routinely send these repairmen for training and continuing education. With their years of experience and updated training, our repairmen can perform any required repairs on all brands and models or appliances and the especially newest technologies. When your appliance breaks down, you should have it repaired now, and not later in the month. We offer same-day repairs for all residents of Fishers. And we can pretty much always complete our repairs on stoves, ovens, dryers, washers, dishwashers, freezers, and refrigerators on one visit on the same day it breaks down. We routinely repair Samsung, KitchenAid, Frigidaire, Bosch, Sears, Sub-Zero, Wolf, Whirlpool, GE, LG, Maytag, Kenmore, and more. For more information, see our FAQ following. We always fill up our vans with the required manufacturer parts and we give you a 12-month warranty on our labor and on all the parts that we install. We always work to guarantee your complete satisfaction. 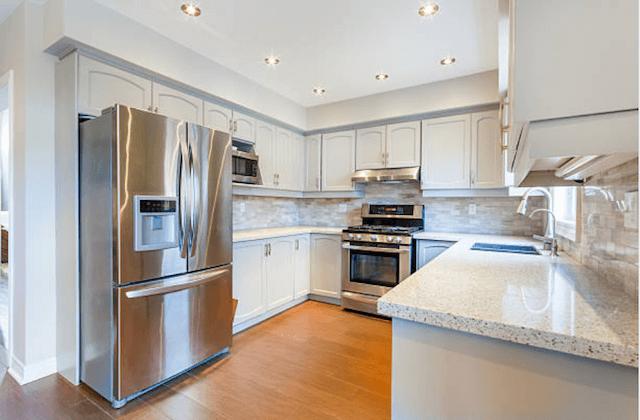 Fishers Appliance Repair has the experience and expertise to repair all refrigerator and freezer problems and we do so for any of the major brands and models. We fix everything from touch panels and burnt-out bulbs to ice makers, water dispensers, and the newest high technology. We troubleshoot cooling issues and fix leaks, condensation problems, loud noises, and more. Our repairmen evaluate your problem then repair the issue or replace with manufacturer parts. Think of our local appliance technicians as on-call to repair your broken stove or range hood. We evaluate and repair electric and gas models. We have years of experience with all the issues related to ignitors, doors, relays, switches, burners, bulbs, and more. Our repairmen carry the tools and have years of training. These factors allow them to fix all types of new and old ovens and stoves very quickly. When a dishwasher breaks down you should schedule same-day service by one of our local technicians. 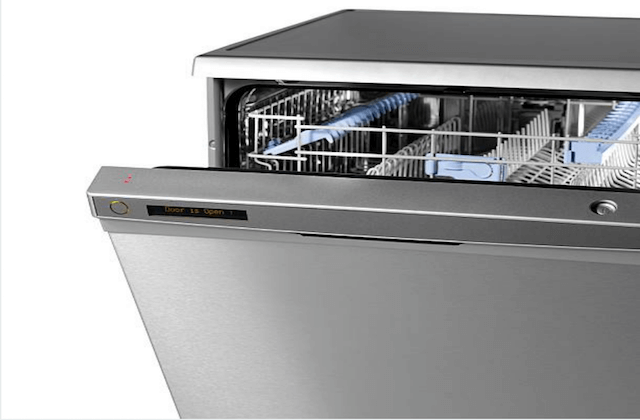 Our repairmen routinely deal with all common dishwasher problems from odors and cloudy glassware to broken solenoids, float switches, impellers, pump assemblies, and other parts. Dishwashers are complicated appliances. Lots of things can go wrong with them. We have the years of training and experience to repair any and all dishwasher problems on the same day that you call. A broken down washer or dryer can be a major problem in your home. But, it is a daily task for our local, certified repairmen to fix. The technician will arrive on time, figure out the problem, fix the parts or replace them. We work on with top-loading and front-loading washers and dryers and we fix problems related to agitation, vibration, noises, doors, switches, control boards, and vent issues. We routinely do same-day repair of washers and dryers at Fishers Appliance Repair. “I can’t thank Fishers Appliance Repair enough for the wonderful job they did in fixing our dishwasher so fast!” – Pamela A. “The kind of customer service you expect from a local, family owned business. I’ll be calling them again the next time I am in need of professional appliance repair.” – Terry W.
“Great service! I was so impressed with how friendly and knowledgable the young appliance repairman was!” – Linda G.
Q. IS IT BETTER TO REPAIR OR REPLACE MY BROKEN APPLIANCE? A. With your broken appliance, you have two choices. Repair it or replace it. It is usually cheaper to repair an appliance than to purchase a new one. But when the repair bills are mounting up, you might decide that you are paying more to fix your stove, refrigerator, dishwasher, or dryer and washer than you would have paid for a new one. The key to this problem is how old the appliance is compared to its expected years of service. We usually tell our clients that when their appliance is in the first years of service and has not been having many problems go ahead and schedule a service visit. But, when the appliance is long past its normal lifespan, and especially when it has been having more and more problems, it is time to check your budget and replace the appliance with a new one. Q. WHAT GUARANTEES OR WARRANTIES DO YOU PROVIDE? A. We give you a 12-month warranty on our labor and for all parts. 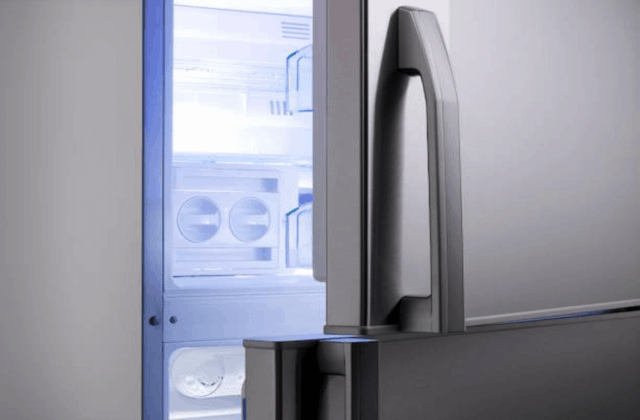 We always install manufacturer parts for replacement for LG, Frigidaire, GE, KitchenAid, Whirlpool, Sub-Zero, Kenmore, and other major appliance brands. Doing this keeps your manufacturer’s warranty valid. And, basically, these are better parts that will last a lot longer. But, if any problem occurs after our repairmen leave don’t hesitate to call us right away! Q. 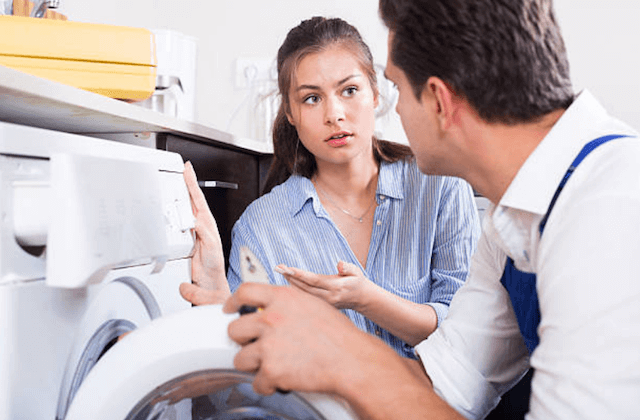 DOES THE TECHNICIAN FIX APPLIANCES ON THE FIRST VISIT? A. Yes, we do 95% of the time. (We always keep track.) To be sure that we are successful in doing repairs on one visit, we routinely stock our vans with the necessary parts and all tools needed for all major appliance repair work. And, we pay attention to what you say when you call and tell us about your appliance and how it is acting up! On the occasions when we need to return for a second visit, there is never a second charge. Q. WHAT IS YOUR APPOINTMENT TIMEFRAME? A. When you call in to schedule your appointment we will provide you with a 2-3 hour window. During that time frame, our technician will show up at your residence. Because we know that your time is important we do our best to come during the early part of the service window. But, when the appointment before yours takes longer than we expect, the “window approach” gives the technician sufficient time to still come to your home on time during the service window. And, our technicians always call to let you know they are coming 10-15 minutes before their arrival. Q. WHERE CAN I FIND A FULL LIST OF THE APPLIANCE BRANDS WHICH YOU FIX? A. Please look before for the complete list. We repair virtually every major appliance brand. But, when your brand is not one of them, we can still help. We may merely need to order the specific parts that you need.